After playing its first two games of the season on the road, the Eagles debut at home tonight against Pahrump Valley. Tickets are $5 for adults and $3 for children. Kickoff is at 7 p.m.
Senior Sam Woodbury gained 72 yards on 10 carries, scoring on touchdown runs of 28 and 3 yards. 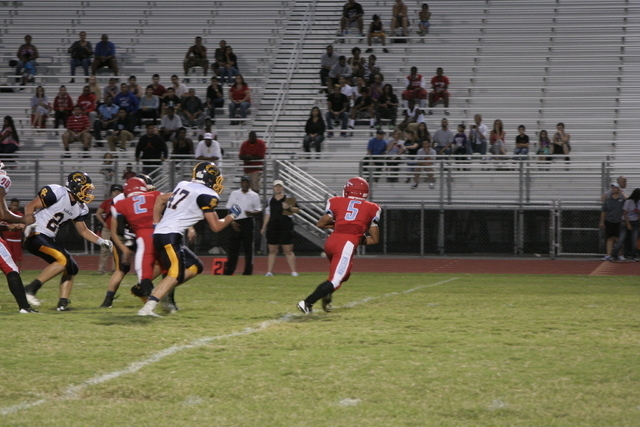 Boulder City (1-1) racked up 235 yards rushing. Junior Brooks Roe started the scoring with a 22-yard touchdown run with four minutes remaining in the first quarter. Roe scored again on a 2-yard run early in what would be a 37-point second quarter. Senior Xavier Steel returned a punt 41 yards for a touchdown, then Woodbury added his two scores. Junior quarterback Trenton Carmell added a 5-yard run with 30 seconds left in the half. Junior Nelson VanDiest added a 1-yard run in the third, and junior Alex Pappageorge finished the scoring with a 10-yard run in the fourth. Junior kicker Andrew Sands converted four-of-five extra-point kicks. The Eagles defense held the Warriors (0-2) to minus-85 yards total offense and no first downs. Steel, senior Dillon Prach and junior Austin Shepard each recovered a fumble. Junior Sam Doane blocked a punt. 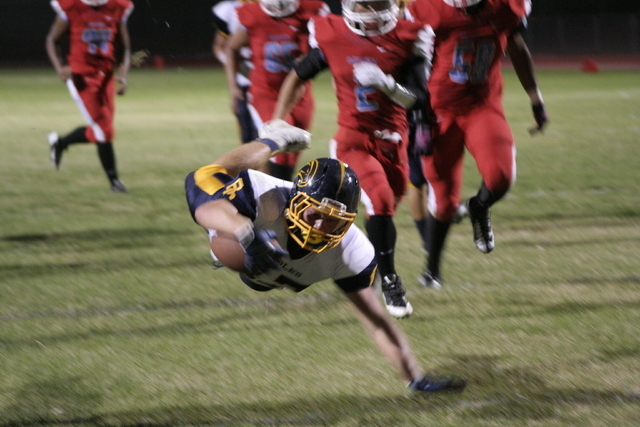 Prach led Boulder City with 10 tackles, and junior Jacob Jurgschat added four. Pahrump Valley (1-1) comes to Boulder City after a 41-27 loss to Desert Pines on Saturday. The Boulder City defense will need to contend with Trojans’ running back Scott Maughan, who rushed for 131 yards and two touchdowns in the loss to Desert Pines. The Eagles downed the Trojans on the road last season 33-6. The Eagles will play their first four games this season against 1-A Sunset League opponents. They play five of their nine games on the road. They are back on the road again at Faith Lutheran on Sept. 20, a team they beat twice in 2012. The Sunrise League games begin Sept. 27 at home against Desert Pines. Sports reporter Pedro F. Fonteboa can be reached at fonteboavegas@yahoo.com.